Average Rating: 4.4 out of 5 based on 169 user reviews. Please enjoy this service, presented at the UU Congregation of the Upper Valley on October 28th, 2012. Step one, featuring Judy’s Magic Cast on and half-hitch directional increases. Step three, featuring a garter stitch cuff and a tidy, mildly stretchy bind-off. Average Rating: 4.9 out of 5 based on 188 user reviews. I have created a few stories and a few support documents for you religious educators and home educators who are using the Spirit Play storytelling method. Please use freely! Also, many of the stories on the Beginning Reading pages can be adapted as Spirit Plays! Spirit Play Story: Origin of the Moon Accompanying Story Pattern! Spirit Play Administrative Files: Spirit Play on a Shoestring. My friends, this PDF of a Keynote presentation is having the darnedest time getting uploaded. I will happily email you the 9.4 MB PDF file. This is a modest addition to the geometrifantastic “Stockinette Short-Row Sphere” by Brent Annable, found for free on his web site. 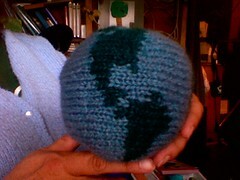 I’ve simply made an intarsia chart to help you turn one of his spheres into a model of Planet Earth. I mean, every kid needs a stuffy planet, right? Begin at the International Date Line and work westward (as the sun does). You’ll find good success with slightly sticky yarns; smooth yarn such as bamboo would be very tricky. 100 yards each of green and blue will be more than sufficient; duplicate stitching Antarctica in white is a nice touch. Average Rating: 4.8 out of 5 based on 175 user reviews.